We followed Pablo's car and came to his house not far away from Puerto Toledo. We met his wife, Uta, a very attractive German woman who he met and married when he was in medical training in Germany. He is originally from Bogotá, Columbia and became a heart surgeon for 8 yrs before switching to train in ophthalmology. He only started practice in Madrid a year ago and got involved with some corporate types who run a string of LASIK clinics which hasn't pleased the other ophthalmologists in town (similar to back home). They really were going to drive all the way to Toledo just to have dinner with us. We thought something got lost in the translation. This would be like taking someone from Santa Monica (LA) to Laguna Beach for dinner. Since the weekend traffic was in the other direction, the traffic wasn't bad at all. We left at 8:30 and Marcia drove the 45 miles to Toledo in 1 hour. We lead the final miles with the GPS to our hotel, the AC Ciudad de Toledo, checked in and got our bags unloaded. I had looked up what were good restaurants in Toledo but Pablo said he was taking us to the best one if it was open. Well, when we got there it was the same one I had read about, the Hostal del Cardinal which was the previous mansion of Cardinal Castenares. The building is built into the walls of the ancient city (which also was once a capital). The place was very nice, the food was great and the company even better. We hit it off very well. I had their two specialties; sopa pescadore (fish soup) and roast suckling pig, which were both fabulous (photo). 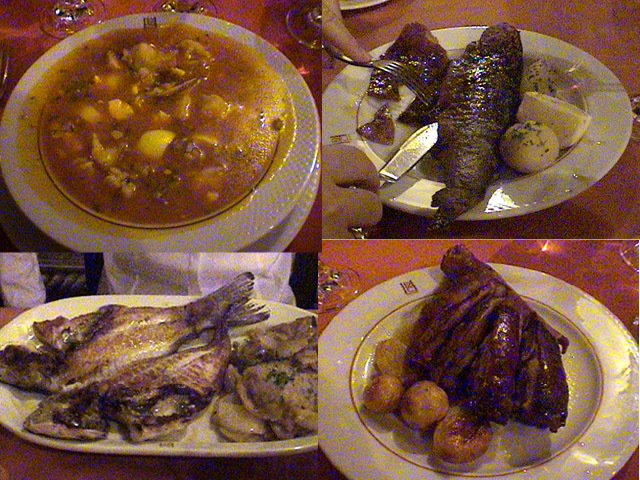 Marcia had onion soup and trout al plancha (same photo). After rioja, Vichy Catalan (agua con gas), piña for dessert and a cortado we said our thanks and good-byes. Pablo was a big runner until he injured his knees, so Uta took up running for him and she is now running 26 mile marathons and will do the next one in NYC. Pablo was very nice in treating us to dinner and driving all the way down here to do it. We look forward to seeing them again. We drove back to the hotel at 1 AM and got to bed at 2 after doing a little computer. The next morning I woke at 10 and again at 10:30. I wanted to get going and see some of this historic city, so I took my camera and went for my run to the old city. It was perfect because the hotel was by itself on the other side of the river with great views of Toledo (photo). The hill was sloping down to the city and it was a perfect run. I went across the bridge over the Rio Tajo (tah-hoe) and up past the walls and through the large ancient gate portico and made it all the way up the steep hill to the main square called Plaza Zacodover and past there to the huge Catedral. I had a cortado at Cafe Capital and I called Marcia and asked her to check out of the hotel, bring my clothes and drive over and park somewhere so we could meet. You have no idea how convenient and important it is for the both of us to be carrying cell phones. We can each go off and do something without sitting and waiting for the other to come back (as we have had to do in the past trips). Also I haven't mentioned the usefulness of the digital messaging with these phones. I used to wonder why all these young Europeans are staring at their mobiles. Now I know; they are typing notes to each other. I first got into it when we were in Portugal when I couldn't make calls out but only send digital messages to others for them to call me. After a while I got used to how to do it, so I continued to use it. I can't recount the number of times I sent group messages to everyone concerned as to where we were and what we were doing. It is easier (and cheaper) than calling somebody and carrying on a long conversation when all you needed to do was let them know a single fact. I believe when you are traveling, it is important for each person to have a cell phone to make the trip safer and more enjoyable. Also, another routine I haven't discussed is the electrical plug game I play at each hotel. Once in the room I hunt for the plugs and hope there are more than one. If not I plug my transformer into with a duplicator plug and then hook up the chargers for the computer, the camcorder batteries and the Palm M505 (photo) otherwise I am dead. Sometimes its easy, other times its very tricky. Most of the hotels give you one plastic card key to get into your room. Once in you must put the card into a slot to make the electricity and air conditioning work. Of course when you leave you have to take it and all the electricity is off. I've learned to outfox them by always asking for a 2nd key "for my wife" and we leave that one in the slot. You learn as you go. I then walked back to Plaza Zocodover and waited for Marcia to arrive which she did (slowly ambulating down the hill from the Alcazar where she parked and been shopping). I changed in the McDonalds while she had lunch in one of the outdoor cafes in the plaza; it was a beautiful day. I then went up the main avenue and had another cortado at Bar Zorba and Marcia found me. They had CNN on in Spanish and by this time it is getting annoying and anxiety provoking - better not to hear how bad everything is supposed to be. So we left and sauntered down to the entrance of the Catedral and paid to go in and tour the place. As usual there are the signs all over saying NO PHOTOS; NO VIDEO and as usual I got great shots of most everything. I forgot to mention that the only thing I didn't get a shot of in Madrid was Picasso's most famous painting "Guernica" and that is because they confiscated my camera upon entrance to the Reina Sofia Museum. We saw it but you can't unless you come here. Barcelona wants them to bring the painting to the Picasso Museo in their city but it is still in Madrid. The Catedral is very huge but very dark (they leave no lights on and there is no natural light coming in) so photos are pretty much a waste anyway. In the museum area of the church there are a number of paintings by such famous artists as El Greco, Tintoretto, Rubens and the like which was quite a surprise. The treasury holds the usual gold and silver chalices no longer used and a huge processional piece intricately designed which must weigh at least a ton. After we left there, we wandered the city to see the other main sights. I peeked in to see the Iglesias Santa Ursula and then we paid to go into Iglesias San Tome (St. Thomas) which contains what is said to be the best El Greco painting he ever did, "The Burial" (photo). They caught me videoing it but I got it before they said something. We then went to the Sinagoga Santa Maria Blanco which is one of only two remaining synagogues in Toledo. It has muédjar architecture and looks like a mosque of the Muslims, yet it is now a Catholic church. We then went to the Monasterio San Juan Reyes which was large and quite nice with a huge cloister (a square hallway with a outside garden in the center of the square. We had to walk all the way back which seemed to take forever to get to the Alcazar where Marcia had parked the car. But in the process we got to walk through all the neighborhoods of the old city. Toledo is very touristy for the Spanish tourists. Arriving at the Alcazar (which was closed), we went into a cafe and had tea and cortado before getting ready to take off for our next destination. Everyone (Angel, Pablo, etc) told us Toledo was the most beautiful town in Spain. In my opinion it was nice but there are many other places nicer and more charming than Toledo.